This gorgeous music jewellery box makes the perfect gift for a little one celebrating a special occasion and can be used for years to come. 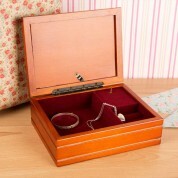 The quality wood box is velvet lined and can hold any little treasures that she gathers over the years. We design, personalise and print the white metal top in house - this includes her name, a date and a short “With Love” message. 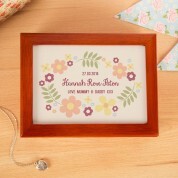 The delicate design features pretty flowers in an oval with the text centred. 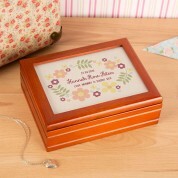 The neutral colours will accommodate any bedroom or nursery décor.